Because nearly every state requires some sort of car insurance or financial responsibility in order to register a vehicle and legally operate it, it’s an overwhelming surprise that not all drivers purchase auto insurance. When a driver doesn’t have car insurance, he or she is an “uninsured motorist,” meaning, he or she doesn’t have the proper, legal amount of liability coverage to cover damages incurred during a motor vehicle accident. Fortunately, that’s where uninsured motorist coverage comes into play. Simply put, uninsured motorist (UM) coverage is a type of car insurance that protects you in the event you’re involved in a motor vehicle accident with a driver who doesn’t have car insurance. Uninsured motorist insurance helps you pay for the costs associated with a motor vehicle accident caused by another driver who doesn’t have a car insurance policy. Generally, uninsured motorist coverage covers bodily injury, but depending on your car insurance company and policy, it might also help cover the costs of personal property damage and even pain and suffering. Uninsured motorist coverage also helps in other scenarios, too. For example, if you were involved in a hit-and-run accident or you were hit by a drunk driver and the driver of either situation gets away, your uninsured motorist coverage could cover the damages. This means you’ll file a claim with your own car insurance company to cover costs such as medical bills related to the auto accident. Generally, these costs are covered up to the amount of limits you have on your policy. NOTE: The other driver must be at fault for the motor vehicle accident in order for your uninsured motorist coverage to kick in. Currently, uninsured motorist coverage is not legally required in Florida, but you can still purchase this auto insurance policy component to protect yourself in case you’re involved in a car accident with a driver who either doesn’t have car insurance or who flees the scene of the accident. Purchasing uninsured motorist coverage in Florida is easy. Speak to your current auto insurance provider about adding this component to your present car insurance policy. Understand that adding uninsured motorist coverage to your policy will raise your insurance premiums. If you feel your premiums are too high, consider shopping around with other car insurance companies to find the best coverage at the most affordable rate for you. Just remember to look for insurance providers that offer uninsured motorist coverage. 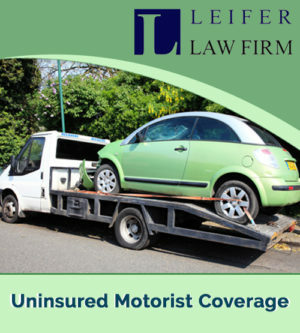 Involved in an Accident With an Uninsured Motorist? If you’ve been involved in an accident with an uninsured driver, contact the personal injury lawyers at Leifer Law Firm right away. We can help you navigate the legal system when it comes to being involved in an accident with a driver who doesn’t have car insurance and make sure you get the compensation you deserve. Give us a call today at (561) 395-8055 or contact us online to schedule your free, no-obligation consultation.